Slender’s Forest Map 1.4.5 is a map where we find and collect eight notes spread around the map, before Slender find us. The map comes with a texture pack that modifies certain aspects, but basically modify an Enderman to make a Slenderman . This map can be played in two modes of game, one is difficult and the other is the drunk mode ;) We can choose the “level” from the spawn map, as so as if we play in day or night mode. 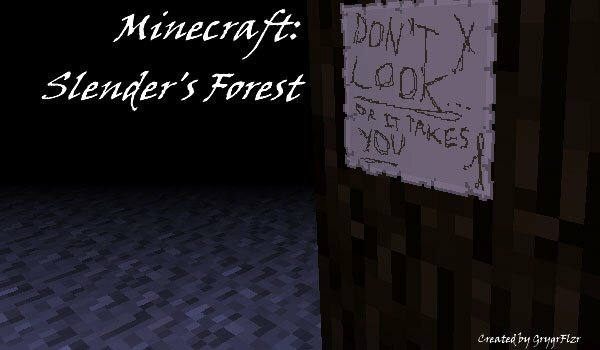 How to install Slender’s Forest Map for Minecraft 1.4.5? PAste “Slender-Beta0.9.1” folder into the map, inside “saves”. Paste “Slender’s Forest-v0.1.7.zip” file inside of .minecraft/texturepacks. Find the 8 notes before the slender finds you!